The Liturgy of the Hours, the recitation of certain prayers at fixed times of the day, is one of the oldest forms of Christian spirituality. Vespers the most ancient of these “offices” set a liturgy of prayer and music against the shadow of sunset. In the 17th Century, Christmas vespers was a festive affair, featuring popular hymns, large groups of singers and instrumentalists in the cathedral. 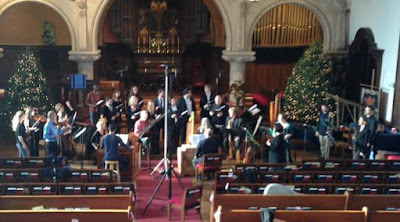 The groups in rehearsal before the December 20 performance at Wilmington's SsAM. The concert recreated Christmas vespers as it might have sounded under the direction of Lutheran composer and organist Michael Praetorius in 17th Century Germany. The performance featured the 13 voices of Choral Arts Philadelphia and replicas of Renaissance instruments — including dulcians, theorbos, sackbuts, recorders, shawm and violone — provided by Piffaro and Tempesta di Mare. The concert marked the first collaboration among the three performing organizations. Christmas in Germany: Dresden Vespers 1619 delivered musical splendor in the old and lush tradition. Featuring music by Praetorius, Heinrich Schutz and Samuel Scheidt — three prominent composers of the early 17th Century Dresden court — the program followed the traditional order of the Vespers service, taking the audience through the expectations, solemn reflections and joys of the Advent season. The beauty of this program lay in the contrast between the simple and the complex. The simple element is the Lutheran hymn tunes that underlie all this music. Choral Arts Philadelphia sang a few hymns in the traditional Lutheran setting. Most of the program, though, featured the complex element: These tunes woven into intricate counterpoint and often decorated with breathtaking ornamentation. Praetorius was the featured composer on the program. His music straddles an interesting period of old-fashioned Renaissance music and new-fashion Baroque. Because of his position in Ecclesiastical circles — a committed Christian who regretted not taking Holy Orders — he did not write opera or concertos. Yet, he did learn a great deal from the new Italian style and his music is replete with virtuoso singing, echo effects and the use of instruments. The audience heard his unique settings of such familiar tunes as Wachet auf, ruft uns die Stimme as well as his less familiar Magnificat super Ut re mi fa sol la, based on the simple melodic motif of six ascending notes of the scale. The offerings from the other composers feature antiphonal writing. Scheidt’s version of Nun komm der Heiden Heiland and Duo Seraphim and Schutz’ setting of Psalm 128 show the influences of the Venetian polychoral tradition. This performance revealed the splendor and ethereal beauty of the Vespers, as well as the magic and excitement of bringing a reconstructed chapter of music history to life. Album Review: Jessica Graae, "Sea Dream"